In the nineteen-fifties, the designers and developers of Detroit’s Lafayette Park believed that they had thought of everything to make city living as attractive as any suburb. A marquee architect from Chicago, Ludwig Mies van der Rohe, had created an array of housing options—rental and coöperative—in modernist slab towers, bars of attached town houses, and rows of low courtyard houses. The sharp-edged volumes were all bound together by landscaped greens and a large public park, romantically named the Plaisance, designed by Alfred Caldwell. The location was minutes from downtown. There was an adjacent shopping center. But, when the first “urban pioneers” began moving in, the ground had not yet been broken for the promised Chrysler Elementary School. “This is a development designed to attract families,” Ruth Belew, a resident of the Pavilion apartments, told the Detroit Free Press. “If the children were forced to cross busy streets like Gratiot or Congress and Larned to get to existing schools, some parents would balk at moving in.” But until enough parents moved in, the school board wouldn’t release funds. The owners, to save their investments, had to think fast: they offered an unoccupied two-story town house to the Detroit Board of Education as a “one-room school,” and, on the recommendation of neighbors, hired Belew—a veteran of both the public-school system and the Red Cross service during the Second World War—to run it. Like a pioneer woman on the modernist frontier, Belew had to design what the architecture lacked: improvisation. With a summer to cram, she devised a course of study that would work for all sixteen pupils, using the city as classroom and calling on professional parents to fill in the curricular gaps. “I can’t sing, but we should be able to work something out,” she said. 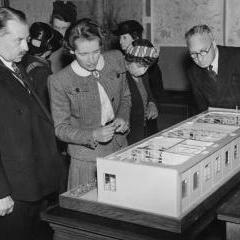 Design and architecture have been, and remain, professions dominated by men. But when I set out to write my new book, “The Design of Childhood”—about the toys, playrooms, classrooms, and playgrounds that make up the worlds of children—I found a funny thing: women. Mostly women like Ruth Belew: handy, empathetic, often educators, ready to step in where they saw design with a capital “D” falling short. These women may not be listed as “inventors.” They may not have had the training to be “architects.” But they were the driving professional forces behind the beginnings of modern childhood and kindergarten education. Working with children, after all, was the rare field in which women’s gender was seen as an asset rather than an obstacle. As children gained their own spaces, their own toys, and their own diminutive furniture, beginning in the nineteenth century, refining, proselytizing, and testing designs meant for children was women’s work. We see their influence everywhere. There’s the novelist Maria Edgeworth, who established the definition of a “good toy” that we still use today: simple shapes, natural materials, something that provides a spark to the imagination. In “Practical Education,” from 1798, Edgeworth and her father, Richard Lovell Edgeworth, describe the contents of the “rational toy-shop,” which would sell “balls, pulleys, wheels, strings, and strong little carts,” and also “pieces of wood of various shapes and sizes, which [children] may build up and pull down.” The idea was to offer sturdy playthings out of which children might make their own fun, rather than flimsy, colorful objects, made out of paper or tin, that came with a narrative embedded in their realistic form. “It is better that a child should tumble down or burn its fingers, than it should not learn the use of its limbs or its senses,” Edgeworth wrote, in an uncanny echo of the new child-rearing directive that risk can be educational.